If you are a smoker, you’re probably aware that tobacco is having a very visible effect on the outside appearance of your teeth – namely, that is causing your teeth to look yellow or even brown. While stained teeth can certainly impact your life (causing you to feel embarrassed or insecure about your smile), an even more serious cause for concern is the impact tobacco is having on what’s below the surface such as periodontal disease. In addition to putting you at risk for various forms of cancers, lung conditions, and heart disease, tobacco use can also increase your risk of getting periodontal disease. More commonly known as gum disease, periodontitis is not something to be taken lightly or ignored. Advanced stages of gum disease can lead to permanent tooth loss among other grave health issues. 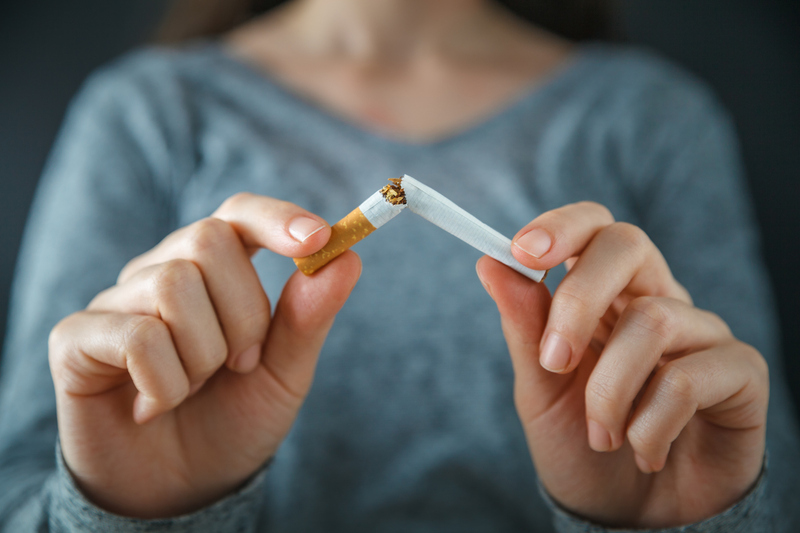 Keep reading to learn more about tobacco and its connection to periodontal disease, and get tips for keeping your teeth and mouth healthy. Whether you smoke, dip, chew, or vape, you are at a greater risk of periodontal disease as a tobacco user. Tobacco is made up of various harmful chemicals including nicotine and tar. These toxic chemicals can irritate your gums, causing a buildup of bacteria. The bacteria eventually turns to plaque and tartar, which leads to gingivitis, the earliest form of gum disease. As gum disease advances, the infection causes the bones and tissues holding your teeth in place to deteriorate. If not treated early on, the end result is permanent tooth loss. Everyone wants a white, sparkling smile but teeth and gums that are healthy from the inside-out are just as important. A study in the Journal of Periodontology claims periodontal disease is the leading reason for tooth loss. Strong teeth and gums are necessary for chewing, talking, and smiling. Losing them would not only have a negative impact on your day-to-day life, but it would put you at an increased risk for infections that can lead to cardiovascular disease, respiratory conditions, and more. Tobacco has also been proven to weaken your immune system. This means that it is harder for your body to ward off gum infections and take you longer to heal once you have one. In fact, according to the CDC, smokers have twice the risk of gum disease compared with a nonsmoker. The best way to keep your gums and teeth healthy is by practicing good oral hygiene. Thorough brushing and flossing using the correct form will help remove bacteria from around the teeth before plaque has a chance to form. You should also schedule regular teeth cleanings – at least two a year – and see a dentist or specialist like a periodontist at the first sign of any decay or infection. Due to its proven link to oral health conditions, the best way to minimize your chances of getting gum disease is to quit smoking entirely. If that’s not an option, you should be especially mindful of your tooth and gum health. Take the first step and schedule an appointment with one of our periodontal specialists today to have your gums evaluated and, if necessary, start a treatment plan.